“What about other teams,” chimed in the Uruguayan receptionist. “You’ll have the odd German or English supporter, but they’re a minority really.” Looking over the Argentinian’s shoulder to watch a video of dozens of men on motorbikes waving Argentinian flags, he asked hopefully, “Uruguay?” I smiled and shook my head. Seconds later, the lobby erupted. On the screen behind us, the camera panned in on José Giménez, who had just scored a 90th minute goal to win the match. “But you never know – the fan base might grow after this World Cup,” I said to him as he did a jig around the room, but my words were drowned out by the clamour in the streets beyond. Groups of park rangers huddled together over their phones, their loud gasps and vehement expletives in stark contrast to the birdsong and lush forests around us. Argentina were playing Iceland – the only Argentina match I could watch on Argentinian soil before leaving the country. While the prospect of witnessing the stunning Iguazú Falls was supremely exciting, I was kicking myself for not planning better. I suppose it would’ve been front of mind had I been in the Argentina camp, but a missed opportunity nevertheless. Leaving the thunderous falls behind, I stepped off the trail and made my way towards a ranger’s hut. “What’s the score?” I asked. Without removing his eyes from the screen under his desk, he said “One all.” I peered over and asked if I could watch for a bit. He pulled up a rickety chair besides him and gestured me to join him. “Where are you from?” he asked. “Bangladesh,” I replied, knowing this would inevitably get him to look up from the screen. “Bangladesh? Where?” he exclaimed, perplexed. As I launched into the ready explanation I usually have reserved for these sorts of questions, he interrupted me abruptly, asking, “But you have football team?” I explained that while it was particularly popular in the 80s, we didn’t have a hugely successful national team. Once again I was met with amazement when I explained the Argentina-Brazil fanaticism prevalent in the country. As he looked through videos of Bangladeshis kitted out in blue and white striped Argentinian jerseys, screaming in jubilation as Aguero scored against Iceland, he exclaimed, “So many people! It’s like Buenos Aires!” And indeed, the similarities were uncanny. En route to our AirBnB from the airport, when I first noted the Argentinian flags strung out from the balconies of the city apartments, it didn’t strike me as extraordinary. In fact, I felt right at home as we drove past a small, corner shop akin to our mudir dokan, flying a large Argentinian flag out front. It was only as I took in the empanadas and mate (stuffed, savoury pastries and herbal tea common in South America) on display that it dawned on me that they had every right to fly the Argentinian flag – we were in Buenos Aires, not Dhaka! While I watched the rest of the match in a tiny hut in the middle of a forest, with racoon-like coatis sniffing at my feet, my husband and son were in the frontier town of Puerto Iguazú, sharing incredible photos from the streets where an amphitheatre had been constructed around a giant screen. The roads were blocked as people spilled onto the streets, roaring as one. The entire nation had come to a standstill. As we walked down the streets of Copacabana, in our newly purchased Brazil jerseys, we suddenly felt like the superstars whose names we wore on our backs. Elderly grandmothers stopped us to smother my son in kisses amidst a steady stream of what I assumed were terms of endearment in Portugese (I could only make out the words bebê and Neymar). Street vendors smiled and ruffled his hair, while shopkeepers handed him free brigadeiros – a chocolatey Brazilian dessert. That day, we watched Brazil play Serbia on Copacabana beach. An hour before the match, the entire city came to a standstill. Shops were shuttered; businesses closed; the usually traffic congested Avenida Atlântica spread out to the indigo Atlantic ocean, virtually empty. 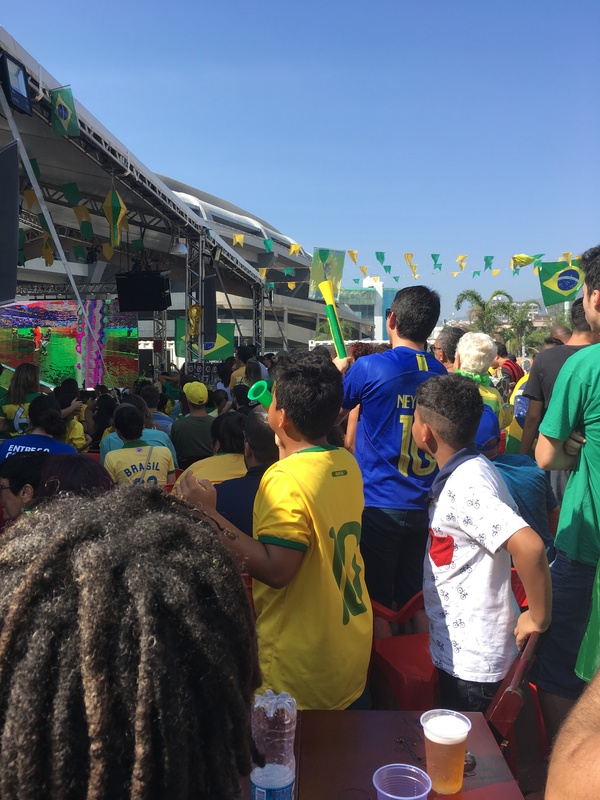 Hordes of residents sporting the verde-amarela, the Brazilian colours, descended on the streets, waving flags and blaring air-horns. Sporadic outbursts of fireworks reverberated around the neighbourhoods. Football fans crowded around screens in juice bars and beach-side kiosks. 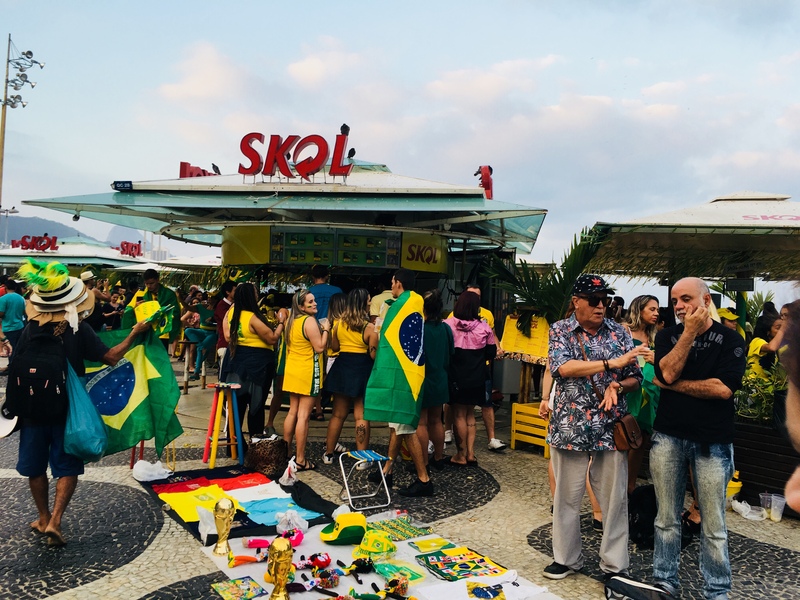 In front of the neighbourhood botecas (small bars), entire families sat clustered around plastic tables laden with huge pots of feijoada (Brazilian stew). 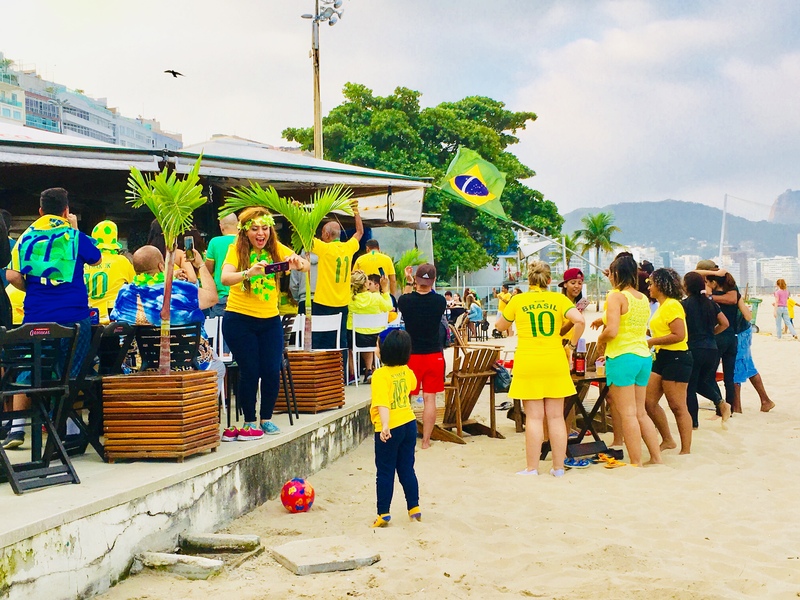 Paulinho scored the first goal amidst a cacophonous explosion of cheers and blaring horns; residents leaned out of their high-rise balconies, waving giant flags; a roving samba band burst into song as a waiter joined the crowd in dancing. For someone who had grown up celebrating every Brazilian goal in a distant land, it was truly surreal. I was relaying the experience to Pedro, a 17-year-old favela resident who was taking me around Rocinha, the largest favela in Rio. Supremely astute for his age, Pedro, pondered about our borrowed zeal and said, “You know, football is religion for us. We worship the players. It’s because most of them were poor like us, but they worked hard and became superstars. We can relate to them, their lives. Maybe Bangladeshis can relate to them too? We do look similar. Same skin colour. Same societal problems. Maybe that’s why so many Bangladeshis support Brazil?” There is certainly an element of truth in what he had surmised. I spent the rest of the day soaking up the World Cup propelled décor around the favela – houses painted yellow, green and blue, flags and streamers covering every inch of the narrow alleyways, and every other person, be it adult or child, sporting a Neymar Jr. jersey. I really could have been back in Bangladesh. My most memorable match however, would have to be Brazil vs. Mexico. I was heading to Boulevard Olímpico which promised giant screens and street parties. En route, I looked at the metro map and realised it was only a few blocks from Maracanã. I’ve long associated the stadium with Latin American football and decided to make a quick detour. I exited the station, pulsating with excitement at the first sight of the stadium. Making my way down to the grounds, I realised they were screening the game there too. With an hour before kick-off, local families and samba dancers alike swayed to the Brazilian percussion group on stage. The atmosphere was electric and I decided to stay. I nervously approached a samba dancer and asked if I could take a photo with her. Confused by my attire (I was wearing my Brazil jersey) and inability to speak Portugese, she asked me where I was from. I launched into my now well practiced story about growing up in Bangladesh, supporting Brazil. Incredulous, she grabbed the bar staff and introduced me to them. They too wanted to hear about Bangladesh’s obsession with Brazilian football and plied me with drinks as I regaled them with descriptions of rooftops flying the Brazilian and Argentinian flags and the rabid rivalry between the two factions. As the match began, I actually got goose bumps when I heard the anthem I’ve grown so familiar with, played under the shadow of the Maracanã. With no goals at half-time I decided to try and make it to Boulevard Olímpico for the second half, in the hopes of soaking in the football frenzy. To do so, I had to make my way through the city center, which was devoid of any life. It was noon. On a weekday. Lines of buses were parked along the side of the main road, their hazards blinking, but there wasn’t a soul in sight. It could’ve been a scene from a zombie apocalypse. I quickly realised where they were as I heard a thundering roar down the street. 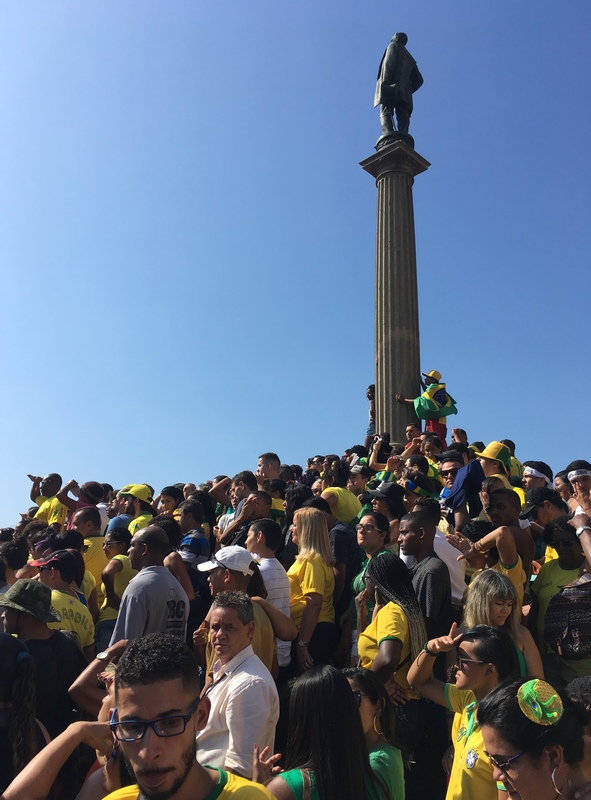 There was a sea of people ahead of me, some clinging to electric poles while others had climbed up on statues. I wound my way between a mass of bodies to catch a glimpse of Neymar scoring a goal before I was consumed by utter pandemonium. The sun was beating down on me, the smell of stale sweat, rancid; the ground sticky from spilt beer and I was hit in the face by a flying ice-cube. Yet, I found myself swept up in a frenzy like no other.